Our 5th ALEF welcomes our guests! Join us in this informal meet up of our presenters and our ALEF valuable partners. Our non profit Americas for Consevation and the Arts (AFC+A) houses exciting programs under the US Forest Service Woodsy Owl Conservation Corps. Team members in our programs develop and lead green action projects with youth, schools and community members to reach diverse audiences. In this meet up and debrief of AFC+A WOCC core team partners and extended family partners we'll explore areas of collaboration and growth with existing USFS and USDA partners, and new partners and audiences. We encourage early registration to afford you any time throughout the festival. From the Upper Basin to the Delta, the Ten Tribes Partnership is forging a new and powerful story of collaboration in the management and protection of the Colorado River from source to sea. Representatives from some of the sister nations that make the Ten Tribes Partnership will share their vision of the past, present, and future of the Colorado River and its people. The Colorado River has produced a rich and vast cultural heritage manifested in music, art, and history. This session will explore culture as an integral part of the living, natural history of the Colorado River. The Colorado River is important to Latinos—it is the lifeblood that weaves, connects, and sustains our food, economies, faith, and traditions. Prominent Latino leaders share their different perspectives on the importance of protecting the Colorado River. Many studies indicate that the Colorado River Basin will be the ground-zero for the impacts of climate change and drought in the US. This session will cover both the significant challenges that our communities are facing from climate change, and some solutions to address these. A Source to Sea Vision of the Colorado River, Part 2: Municipal River Sisters Initiative. The restoration of the Colorado River can be vital for the economic development and quality of life of Citizens of the River on both sides of the border. The River Sisters initiative aims to reconnect urban Colorado River water users to the River by celebrating and raising awareness of their hydrological, social, and economic interdependencies. The ecological restoration of Colorado River’s ecosystems represents some of the most complex big river restoration projects in the world—and its Delta restoration efforts one of the most inspiring environmental stories in the past 25 years. Yet more often than not, decision-makers and Colorado River restoration advocates and practitioners don’t have a deep and holistic Source to Sea perspective towards the River. This session brings together the leading figures restoring the Colorado River from its source to its delta to share their work and perspectives for the future within the context of a Source to Sea vision of the River. Moderator: Jennifer Pitt, Director, Colorado River Program, National Audubon Society. Panelists: Carlos Fernandez, Colorado State Director, The Nature Conservancy (TNC); Osvel Hinojosa, Director, Water and Wetlands Program, Pronatura Noroeste; Francisco Zamora, Director, Colorado River Delta Program, Sonoran Institute; Dr. Jorge Ramirez, Autonomous University of Baja California; Meg White, The Nature Cosnervancy-Colorado. Texas Environmental Justice Advocacy Services's (t.e.j.a.s.) leader Juan Parras and his resolve for equity, justice and community resilience is the driving force behind the T.e.j.a.s. with over 40 years of organizing and work from social services, to labor, to environmental justice Juan Parras can attest to the empowering force behind marrying issues of intersectionality in environmental work for marginalized communities. This panel discussion will provide a a primer on the Core Priorities for 2017-2018 that were voted upon and selected at the GreenLatinos National Summit. Participants will hear from Co-Chairs of the GreenLatinos Working Groups that are developing the strategies to address critical environmental and conservation issues and leading the actions and advocacy on these issues to move these priorities forward. The panel will discuss the coming challenges and opportunities for action on environmental justice, civil rights and public engagement; indigenous rights and sovereignty; climate and clean air; toxics and pesticides; and clean water. 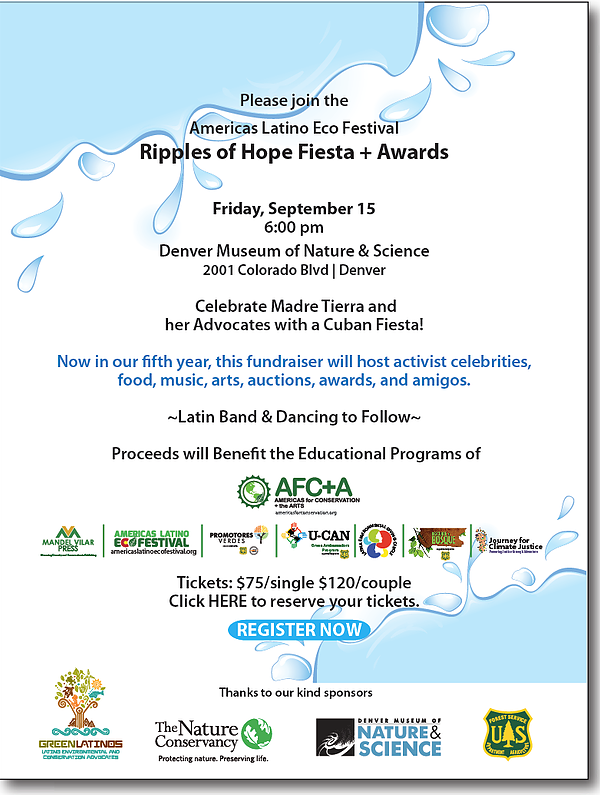 Join ALEF in presenting Nuestro Hermano award to leader Chairman Dave Archambault from Standing Rock. To honor his work, the progession of the movement, the spirit of the people and the effort set forth to defend our natural resources. We are honored to have his presence and insight at the festival and will continue to support his efforts. ALEF will bring together the anchoring blessings of Standing Rock in our dreamers awards cereminy in a call to action to defend DACA and build on a shared coalition between our First Nations and GreenLatino leaders. Join artist Alex Falco from Havana Cuba for tours of the Artivism exhibits which summons artists from all over the world to participate in this drawing contest. Falco will lead tours througout the exhibit to highlight the crucial points that each work highlights. Attend if you are interested in a more in depth conversation about the thematic values each artist brought from around the world. During these uncertain times, it is critical for organizations to work together to address policy changes by influencing the right target audiences to action. This requires a strong grasp of strategic communications and understanding of how storytelling and artivism can support making your organizational objectives a reality. This presentation and afternoon workshop is designed as a communication capacity-building training and will offer a dynamic exploration of the fundamentals of strategic communications. It will explore the importance of outlining quantifiable objectives, identifying key decision makers and target audiences, building effective message frameworks and executing creative tactics such as storytelling, art activism, and social media as part of your broader communication efforts. The training will include video presentations and facilitation. But also be ready to work in small groups and share your findings in large group discussions! Join this convening of women leaders committed to growing capacity for Latina environmental advocates! Tapas and a panel will kick off a dialogue on how best to grow the movement thorugh philantropy, mentorship, and civic engagement. Lsten to the wise words of our keynote Dr. Lydia Prado, national leader of cultural competence practices in academia and the health arena. 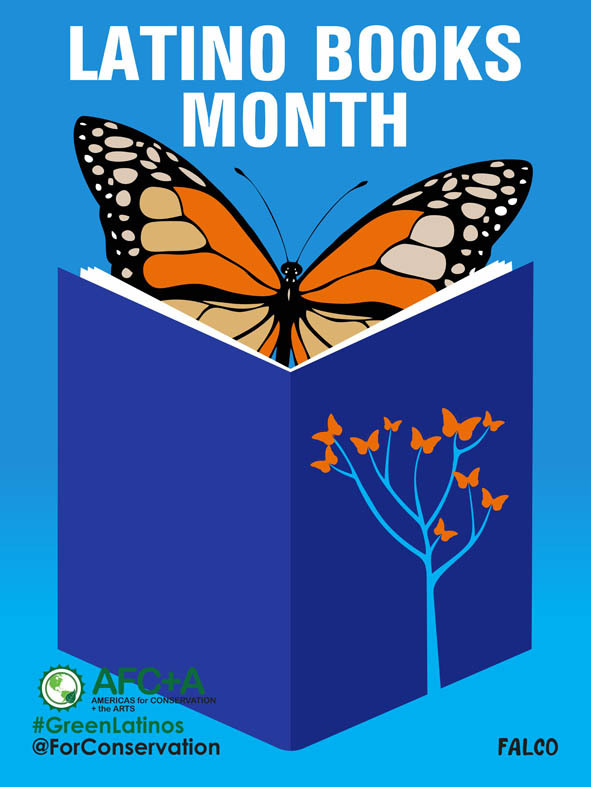 Visit our thematic book fair advancing diversity and conservation in pubkishing! Fourteen tables of exciting selections representing subjects of ecology, outdoors, literature, travel, and our region of honor the Colorado River! Vinyasa Yoga Flow * Vinyasa synchronizes breath with body movements.Yoga strengthens the mental, physical and spiritual health. It helps to keep a flexible body, release stress and brings relaxation to your life. Bring your yoga mat, a bottle of water and wear comfortable clothes. * Consiste en sincronizar la respiración con el movimiento del cuerpo.Yoga fortalece la salud mental, física y espiritual. Ayuda a mantener un cuerpo joven y flexible, libera el estrés y trae calma a tu vida. Traer tu colchoneta de yoga, una botella de agua y usar ropa cómoda. Martín Better Longo (Ecuador) & Gio Blackmon (USA) are an intergenarational blend of Tropicalismo and World Music coming to Denver from New Orleans! Join scheduled art walks to hear directly from ALEF eco artists about their work and its dialogue with mother earth. Therapeutic Healing Touch and Stretches for the Body Lear how to massage your family members! Learn how stretch your body to heal chronic pains Técnicas de masaje y estiramientos del cuerpo Aprende a masajear a tu familia! Estiramientos del cuerpo para sanar dolores crónicos. Americas Latino Eco festival invites 15 artist to compete in the very first Eco-Artivist Challenge. A competitive arts showcase highlighting climate justice and our responsibility as stewards of this planet while supporting local Colorado artists. In a world with growing concerns for climate change and the crisis we find ourselves in, art is a language of unity and progress. Colorado artists are invited to support, connect, and compete in an arts showcase highlighting nature and conservation. Joins us as we celebrate with our 2017 Nuestro Padrino Award Congressman Jared Polis for his extraordinary environmental stewardship and advocacy for protections that safegurad the health and well being of Colorado's Latinos. The ceremony will lead into our Promotes Verdes graduation and Mr. Polis's commemcement adddress. Vinyasa Yoga Flow * Vinyasa synchronizes breath with body movements.Yoga strengthens the mental, physical and spiritual health. It helps to keep a flexible body, release stress and brings relaxation to your life. Bring your yoga mat, a bottle of water and wear comfortable clothes. * Consiste en sincronizar la respiración con el movimiento del cuerpo.Yoga fortalece la salud mental, física y espiritual. Ayuda a mantener un cuerpo joven y flexible, libera el estrés y trae calma a tu vida. Traer tu colchoneta de yoga, una botella de agua y usar ropa cómoda. Adriana Pulgar (Venezuela) Artistic Creations, Reiki Practitioner. Mariachi Sol De Mi Tierra enjoys a prestige that they have gained over the years. In the past 12 years, they have been a part of various events associated with the National Western Stock Show. For the past 9 years, they have shared the stage with the Colorado Symphony in the festivities for Cinco de Mayo at Boettcher Concert Hall. Witness the graduation of the 1st Promotores Verdes class as family members celebrate de completion of the program. Promotores Verdes grows family based advocates for better health through nature experiences. This is a culturally sensitive, intergenerational, community-based educational family program tha promotes the Nature RX Movement in the Latino/Hispanic community. This Summer 2017 over 100 families explored the outdoor and its benefits to health, people’s health and the interconnectedness with the health of forests and ecosystems, eating/active living, and environmental leadership and advocacy. Background: Baragutanga is a seven-piece band – representing four different countries (Bolivia, Ecuador, Peru,USA) – prides itself on arranging traditional South American rhythms, such as huayñoand cumbia in new andinteresting ways. Planetarium Show "Belisario: The Little Big Hero of The Cosmos"
In celebration of our 5th anniversary ALEF will host a free screening of the amazing "Belisario, the little big hero of the cosmos” at the Planetarium Denver Museum of Nature & Science during our Family Day on 9/17! Don't miss it! Space is limited for this historic screening of the first animated series in Latin America produced in a full dome format and talk with Bolivian producer Yashira Jordán, founder of Celeste Estudio Creativo (Argentina, Bolivia, New York) who will tell us about her production with The City of La Plata’s Planetarium. “Belisario" tells about the adventures of a little astronaut mouse, who travels through time to register his name in Argentina’s Astronautics history. Throughout his trips, he will witness the most relevant events and face unforeseen dangers that he will need to overcome to survive. Fulldome is the biggest audiovisual format in the world, which can create immersive settings being projected on a planetarium dome - a half sphere. Belisario's soundtrack has been composed by the Chilean composer Alberto Peña and recorded in Bratislava with the Bratislava Symphony Orchestra. Musical references derive from composers such as John Williams, Alan Silvestri and Danny Elfman, among others.